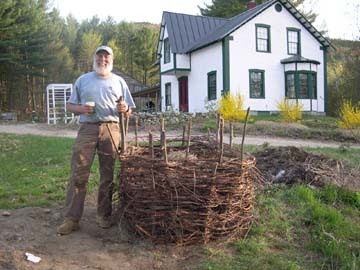 Michael above with our own rendition of the Slovinian Compost Basket. 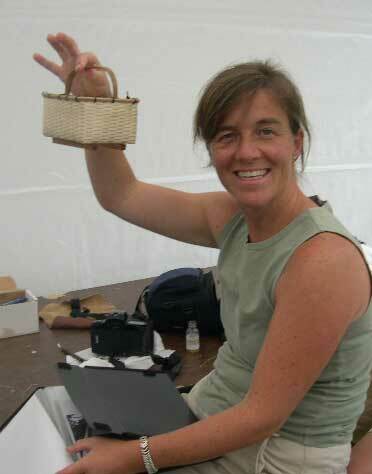 We discovered this style of compost basket while on a European trip with our friends, the Dulacs. The original was near a church across from a mountain lake in Slovinia. Especially for the Sycamore ladies above and below (mom with Martha). 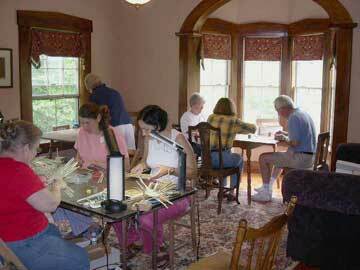 We had basketmakers on the porch, basketmakers in the den, and even basketmakers in the living room for Basket Weekend. 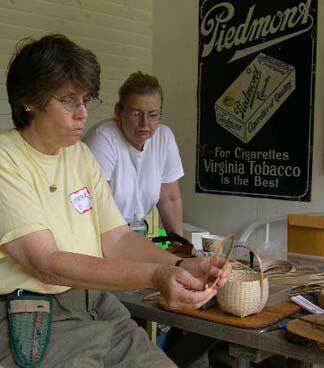 Martha Wetherbee demonstrates preparing the rim of an authentic reproduction Shaker basket. 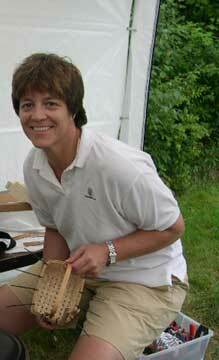 Martha Wetherbee is the world renowned expert on Shaker basket making and we were very lucky to have her teaching at the Farm. 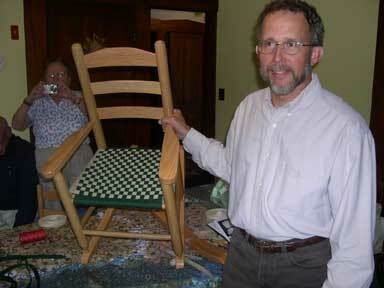 New for classes at Sculptured Rocks Farm ... chair seats by Jean Bove. 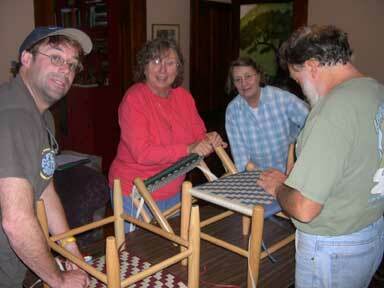 Look for more upcoming classes from Jean. Yes, we do call Harley Davidson's beautiful. 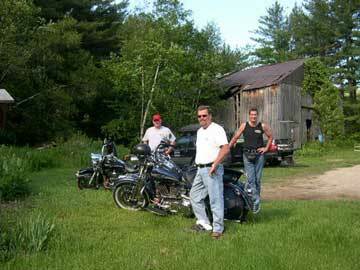 Pictured are 3 visitors from Long Island New York rumble in for Laconia Bike Week. Michael got his Harley for his 50th birthday. Book your reservations early for this busy week. 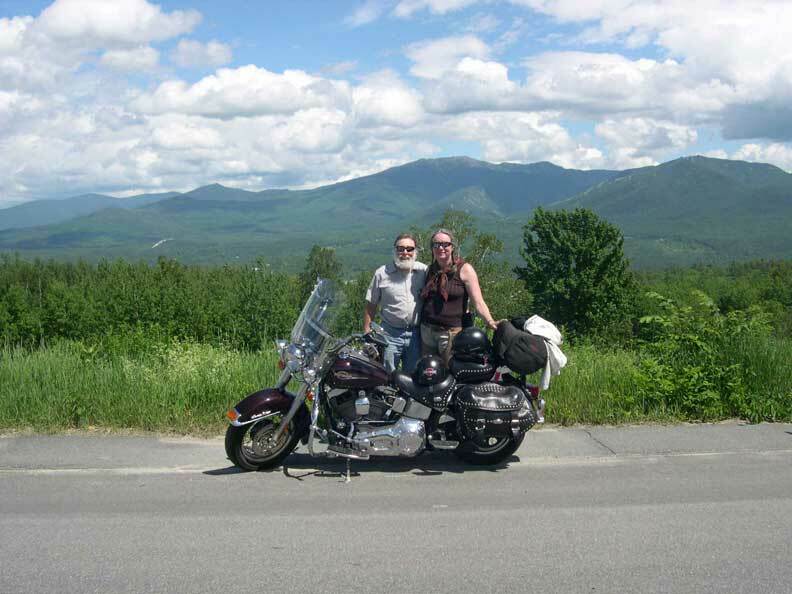 Laconia Bike Week brings people into the area from all around the world. So, if you wait too long there won't be any room at the inn. Bike week specials - book the front three rooms at Sculptured Rocks Farm and we will add in a very comfortable sofa-bed in the den at no extra charge. Only available for groups of four couples - minumum stay five nights. We can accommodate up to five couples. 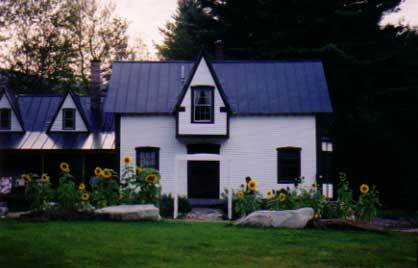 Join us for some excellent tours of New Hampshire's beauty. 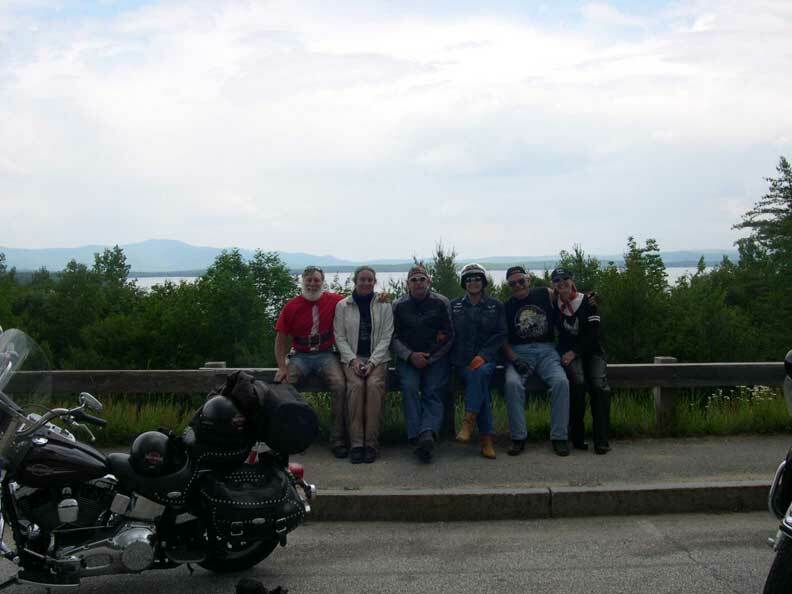 Overlooking Lake Winnipesaukee in Alton along with Jerry, Lorraine, John and Cheryl. 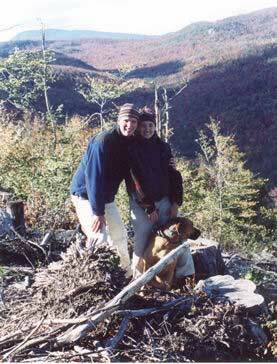 Mike and Dawn at a Franconia Notch overlook on the Lupine Run. The gardens at Sculptured Rocks Farm were spectacular this year. I kept saying "I can't believe this is my garden". 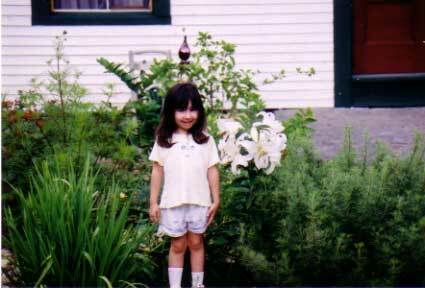 Layne is posing next to the gorgeous Madonna Lily courtesy of Alison Bagley of Foxglove Gardening. Join us Sunday of Memorial Day weekend at 2 pm for the "Annual Perennial Swap". 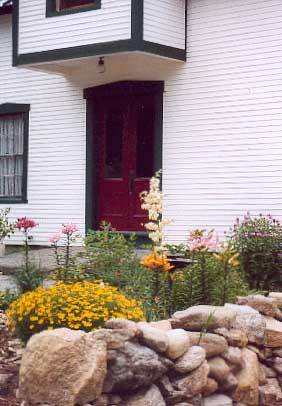 Book your reservations for a gardener's dream bed and breakfast stay. Over a 100 people usually attend, all bearing fabulous plants to trade. Our granddaughter Layne is seen above at the sign at the end of the driveway. Since moose make frequent appearances at Sculptured Rocks Farm, we thought our backyard moose should be included as part of our logo design. We hope to see you at the Farm soon. We have four cozy rooms ready and waiting for you, so make your plans now. We can accommodate up to 16 people if we are filled to the brim. It is a great place to plan of family or friends gathering. For large groups that fill the whole Farm, we have an extra refrigerator and let folks use the kitchen and outdoor grill for meal prep. For anyone who remembers the perennial swap invitation of 2001 you might recall some very unrealistic flowers in front of the Sculptured Rocks Farm. These sunflowers are the real thing. The gardens at the Farm are coming along great, thanks to all our friends who have shared their plants at the "Annual Perennial Swap". This year's event was a huge success... over 100 people and hundreds and hundreds of plants. Plan on attending next year... mark your calendar today for Sunday of Memorial Day weekend at 2 pm. Better yet, book your reservations now and stay for the long weekend. 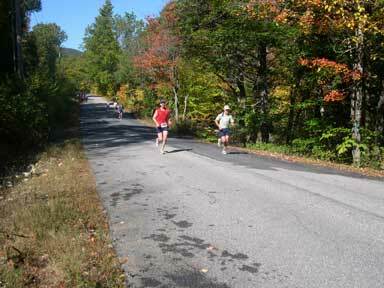 2006 New Hampshire Marathoners, Jody from Arizona and Ralph from California, found their way to Sculptured rocks Farm. Ralph lost his support team somewhere along the way, so we cheered him on from the mile 14 water stop (right near the bed and breakfast). 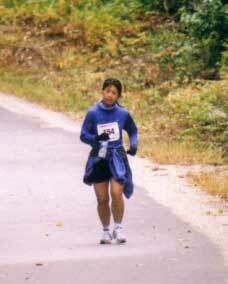 Peter and Yen (Texas) joined us for the 2003 New Hampshire Marathon. As the saying goes "every things bigger in Texas" and these two have the marathon records to prove it. 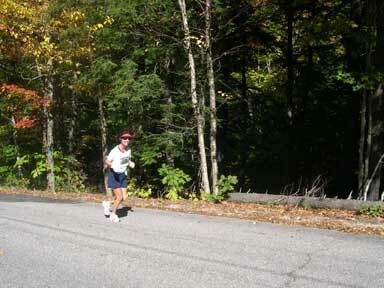 Yen is on her third go around competing in marathons in all 50 states. After running the marathon here at Newfound Lake, they came home took a shower and took off for Portland, Maine to run another marathon Sunday morning. 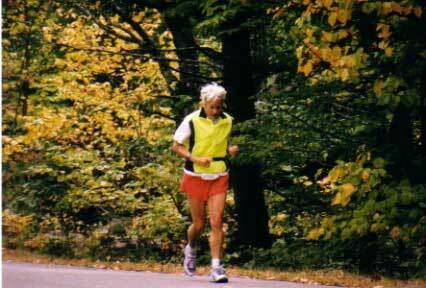 This was just a prelude, after they got back to Texas they ran a 100 mile race. We won't tell about their LL Bean excursion, we'll leave that up to them. Hope to see you both back here next year. 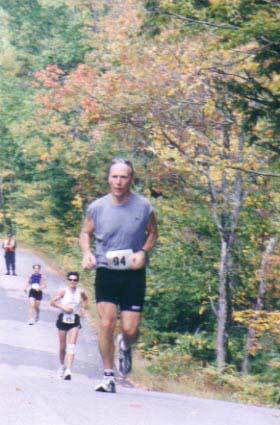 Another one of our courageous runners. 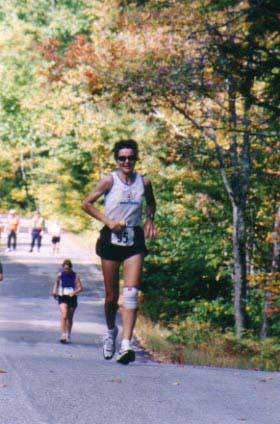 Linda came in first in her age group at the 2003 New Hampshire Marathon. She came with her own entourage and cheering squad. We enjoyed your company so much and hope you'll come back again. Sculptured Rocks Farm is the perfect place to celebrate any special occasion. Carol and Richard were surprised when they drove up to the front yard to find a few dozen friends here to celebrate their thirtieth wedding anniversary (including Carol's childhood friend McGee who is one of the newest converts to Sculptured Rocks Farm life). Because they are frequent guests at Sculptured Rocks Farm, their children chose this beautiful setting as the location to celebrate their special day. 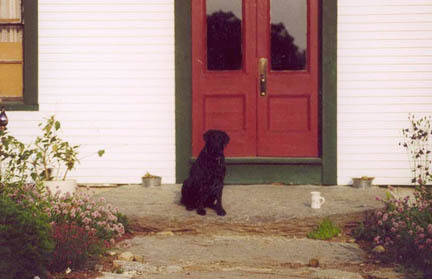 A rock band performed on the large farmers porch playing music from the era of their marriage while guests enjoyed a barbecue and clam bake. 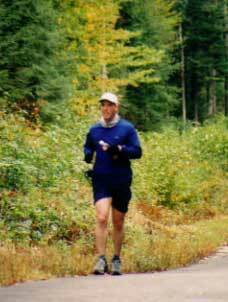 Terry and Kay joined us at Sculptured Rocks Farm for the 2002 New Hampshire Marathon. Wow! These two are our heroes. They are working on running a marathon in every state in the union... and they don't have far to go. They ran the New Hampshire Marathon on Saturday, came back to the farm, soaked their legs in the ice cold Cockermouth River than packed up their car and headed to Portland for another marathon on Sunday. Guess what? They finished that one too! Dawn's passion is the gardens around Sculptured Rocks Farm (Michael is even learning to love pitching in with the weeding when he sees the great end results). It is a passion of many of our friends as well. 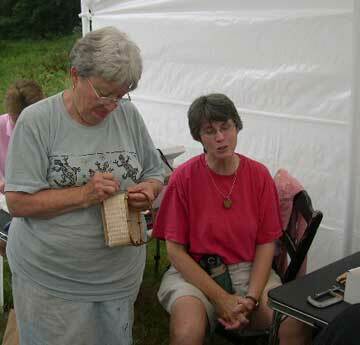 An annual event at Sculptured Rocks Farm is the Annual Perennial Swap. Always the Sunday of Memorial Day Weekend at 2:00 pm this is an event that attracts up to 100 people each year. 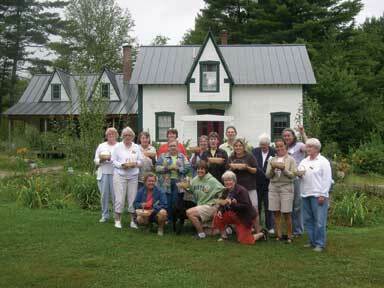 Friends bring extra perennials from their own gardens to trade for new and different species. This isn't an event for the faint of heart, it is more like Filene's Bargain Basement shopping, so if you see something you really want, don't be shy. Swapping starts promptly at 2:30 pm, don't be late because when the whistle blows the rush for the most unusual species begins. Most of the flowers in the Farm gardens came from the swap. This is a big event each year... if you are interested, book your room right away because rooms fill up fast and only farm guests and special friends are invited to this event. 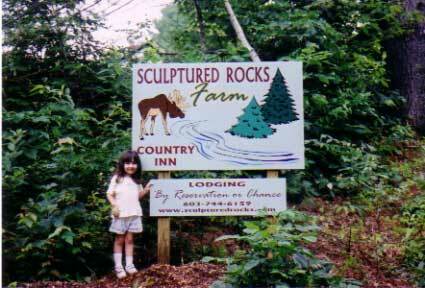 Life is pretty simple at Sculptured Rocks Farm. A cup of coffee and a seat on the big front stoop surrounded by fragrant blossoms... what could be more relaxing? 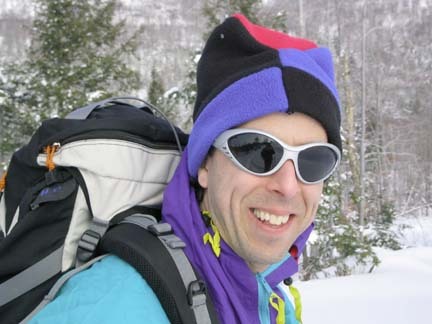 Santa himself (Michael) takes in a little skiing on the mountain right behind Sculptured Rocks Farm. 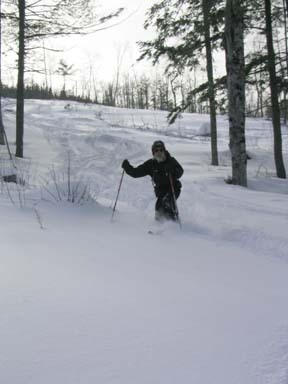 Dawn taking a few telemark turns at Sculptured Rocks Farm. Pearl watches while Dawn and Caitlin catch up with her. 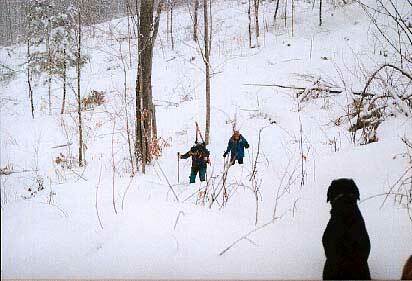 This was our first attempt at skiing down Spruce Ridge behind Sculptured Rocks Farm. Caitlin is snowshoeing up and will ski down on downhill skis and Dawn is skiing up with skins on her telemark skis. What a fun day... you will have to try it. Uni, Caitlin and Oden on top of the mountain behind Sculptured Rocks Farm. but they saw the real thing that it was named for very close up. 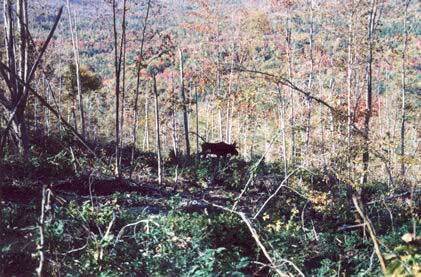 This large bull moose was roaming around right behind Sculptured Rocks Farm. Joe, Gail, Ann and Sal. 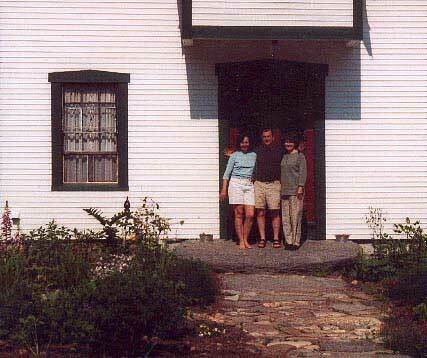 The Tansey sisters have known this house since their childhood (just like Dawn). 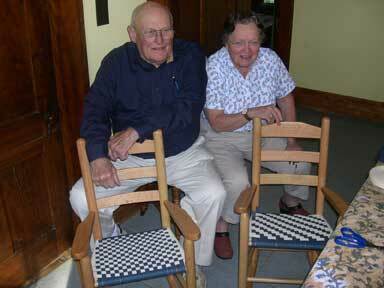 When their nearby family summer place was filled to the brim they came down the road to join us as guests. 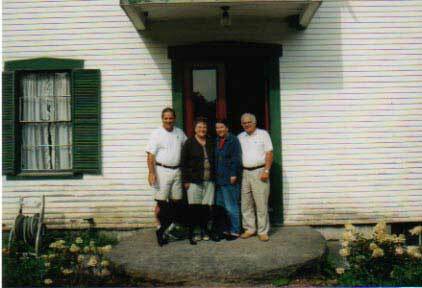 They were among our earliest guests - the Farm still hadn't been painted as you can see from the photo. We hope they enjoyed their stay as much as we did.